SUDDENLY is the 2013 remake of the 1954 Frank Sinatra film of the same name. But while the 1954 original is a treatise on guns and war and their effects on society, this 2013 remake is a moronic action movie created specifically to give erections to Republicans. 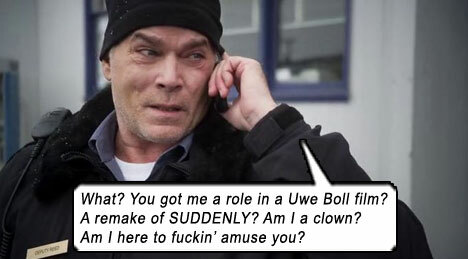 Any wonder – it’s directed by Uwe “Toilet” Boll, the groovy ghoulie Ed Wood of our generation. With no eye for framing, no ear for wit, no comprehension of structure more layered than a car chase, Boll and writer Raul Inglis tediously slap a few disjointed scenes together and claim it’s a movie. Three men, led by unbalanced ex-army thickneck Baron (Dominic Purcell), overrun a suburban home in the small town of Suddenly, because it provides a prime vantage point to assassinate the president when he does a stopover. Ellen (waify Erin Karpluk) is taken hostage in her home, along with her son Pidge and old father. Ray Liotta stars as Tod the town sheriff, an alcoholic who is trying to date Ellen, and who is hiding a dark secret about Ellen’s soldier husband killed in the Iraq war. All the unnecessary backstory and plotting does nothing to aid this shallow, linear thriller, padded to the brim with badly-choreographed fistfights and people being chased through the woods, instead of compelling arguments on weapons and wars in America. The character names are the only ties to this movie’s predecessor, otherwise it shares no connection whatsoever to that movie’s themes and structure; simply cookie-cut from the generic Assassination For Dummies Movie Handbook. For all the marquee strength Liotta brings, Michael Pare immediately loses it all by appearing as one of the assassins. Movie loses even more cred when we discover Pare was cast to be the emotional assassin, playing opposite the coldhearted (read as non-actor) leader Baron (Purcell). Thick-necked Purcell’s imposing physical presence is belied by his insubstantial acting chops. He looks more ready to star in a Wrestlemania bout than an action-drama film, lacking any gravitas that would distinguish him as a calculating professional killer; coming across like a challenged doofy who can hardly lisp his orders without tripping on a barbell. Everything is colored differently in SUDDENLY 2013. In the original, politics was cannily kept out of the equation: here, it is meant to be 2013, and we all know who’s in the white house, and Baron just can’t stop dribbling Obama Derangement Syndrome at every turn: “This president has destroyed my country – your country – taken away the principles that made this country great.” Oh, you mean like reducing the deficit, creating jobs, establishing healthcare, ending two wars that were sapping the country’s wealth, integrity and worldwide credibility?… “We must restore the country to its greatness, then the American People can stand tall and proud once more.” All that’s missing is the triangular douchey hat. If everything is colored differently in this 2013 movie, well, even the president is colored differently in 2013. And this movie is just vicariously allowing these assassins to do what every red-blooded white-hooded Republican has wanted to do since 2008. In this movie, unlike the last, serving in the military is a no-brainer hero-angle kiss-the-sphincter default position. In the original, Ellen complained that her husband died in the war for nothing, while Ellen’s husband here is taken for granted as a “hero,” a soldier dead in battle with a shrine in her bedroom replete with triangular-folded flag. There is thusly no combative attitude toward guns – because military and guns are two hot button topics that should only be touched by good filmmakers. Now waitaminute, movie is so confused it is actually making Tod look like a credulous redneck who believes the lie that Iraq was to “stop terrorism,” and Baron looks like an informed, outraged patriot. But, uh, Baron, “this president” didn’t start that war. The last president did; a Republican, you misinformed twit! Are you following world politics or Rush Limbaugh? Of course, Obama lives, because no presidents get assassinated in American films. Sorry, Republicans, not even black ones. Starring: Ray Liotta, Erin Karpluk, Dominic Purcell, Don MacKay, Cole Coker, Tyron Leitso, Michael Paré, Steve Bacic, Garry Chalk, Brendan Fletcher, Daryl Shuttleworth, Chris Shields, Haig Sutherland.